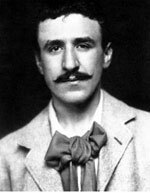 Charles Rennie Mackintosh (1868-1928) was a famous scottish designer and architect . He was one of the most influent artist of "Art Nouveau" in UK. 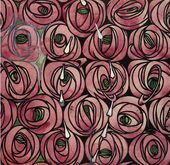 His wife, Margaret Macdonnald, a former stiudent at Glasgow school of art, was deeply involved in their creative life. The Mackintoshes moved to Chelsea in 1915. To improve his meagre income he started designing for the textile industry. Between 1915 and 1923 he produced over 120 designs. 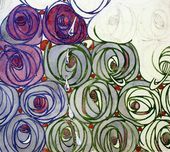 From 1915 to 1923 Mackintosh produced over 120 textile designs , either patterns based on stylized flowers or more abstract motifs. : Odalisque ( comes from a turkish ord, Odalik. An Odalik was a virgin female slave in the Seraglio.